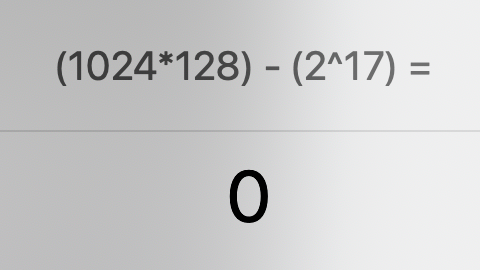 [SOLVED] spotlight math calculation precision 0 = 1E-29? 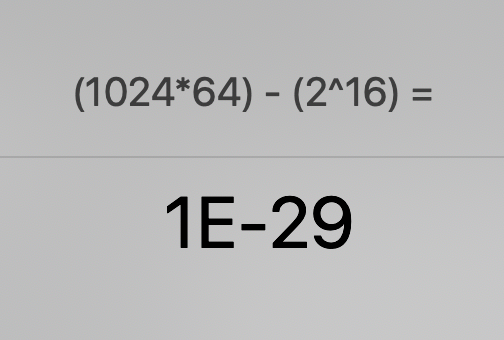 Any idea why if typed into spotlight search, the first formula results in 1E-29, while second formula result in 0? Can a step-by-step explanation be had as to why this bug exists? It's clear this calculation is performed with floating-point arithmetic, though I believe as there is no "floating-point" per-se in this calculation, the inequality is a bug, and not a result of floating-point arithmetic limitations. My intuition tells me this could be done with only integer arithmetic as there is no negative value and no decimal point. To be clear, I don't rely on my intuition, and I'm happy to be told that it is wrong, if that is indeed the case. I'm just interested in the specific anomaly that leads to this inaccuracy. Clearly it’s a bug if you believe the exact math should match. It’s probably also a feature since the math library chosen was likely chosen to be fast and small for the math it needs to do and not scientific accuracy for calculating a moon landing. This sort of rounding errors happens all the time, especially if you’re sloppy or don’t implement a guard digit for “small numbers” like 65k. All math libraries make approximations when they encode values, so the bits sometimes matter when you are checking for something that’s very close to zero. In your example the two large numbers aren’t perfectly represented and you get a very insignificant rounding error that doesn’t cancel perfectly when the subtraction happens in one case but not the other. The 1e-29 should be rounded to zero IMO unless the goal is to introduce people to this concept. When you need to be precise, use PCalc or another calculator that handles precision and rounding properly. Also, if you take 1E-29 of the weight of the earth, that’s just under 60 mg. If you were estimating the mass of the earth, you’d be of by more than a snowflake and less than a grain of sand. This quite literally is the proverbial “making a mountain out of a mole hill”. That being said, if you like math or computers, this is very cool, since it exposes the internal representation of a number and you see how an approximation can cause rounding errors for not that very large numbers in this case. There are legendary (to engineers and programmers at least) books devoted to numerical recipes and tricks to do quick and accurate calculations when you don’t bring along a perfect math library. I'm vaguely familiar with floating point rounding errors/limitations, but I assumed that it doesn't apply in this situation because 1 - this is not a floating point calculation, and 2 - the larger value/calculation results in zero correctly, there must be something else going on with the smaller value/calculation. I'll read up a bit. @Mark I’ll soften the wording - it could be a bug or a feature depending on your goals. What’s clear is this is what happens in math on digital computers, that is for certain. I’ll link to your awesome oracle doc on guard digits and some theorems about floating point representations. [SOLVED] Can I add more math constants to Spotlight search? [SOLVED] Why does Spotlight pick the DVD Player app when I enter the math equation 5*3? [SOLVED] Base computation via Spotlight? [SOLVED] How useful is spotlight?